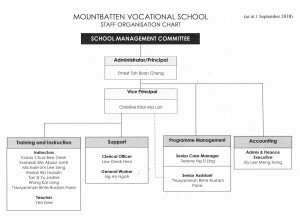 The MVS Management Committee which meets at least three times annually, supervises the conduct and management of the School in compliance with the requirements of the ITE and MOE. The MVS Management Committee appoints sub-committees for any purpose or affairs as it may deem necessary or expedient, with the main objective of providing primary education for deaf children. The Committee of Management which is appointed biennially by the Executive Council, Singapore Association for the Deaf, operates according to the Education Act, Cap 87 (1985 Ed) and the School’s regulations.